Mindfulness isn’t anything that we think; it’s what we don’t think. Mindfulness isn’t something that other people do; it’s something that we all do. Mindfulness is an ancient, life-enhancing, healing technique that can help us remember our natural state of happiness and health, even if we think we are too modern and too busy to prioritize what’s really important—being fully alive and fully alive to our full life potential. 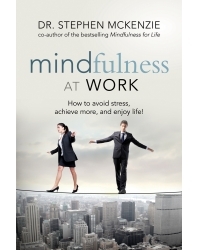 Written by an expert with years of both clinical and personal experience, Mindfulness at Work includes examples of mindfulness in action in the workplace, while also showing you how to apply its lessons to specific professions, from sales to teaching, from law to medicine, from the trades to the creative arts. Dr. Stephen McKenzie has spent more than 20 years researching and teaching a broad range of psychological topics, including depression, dementia, substance abuse, and, most recently, mindfulness. Dr. McKenzie has a unique ability as a lecturer, researcher, and writer to present potentially complex information in a warm, engaging, and entertaining way. He has recently been appointed as the Research and Evaluation Officer for the City of Greater Geelong’s Preventive Health Initiative. He is coauthor of the highly successful Mindfulness for Life.